This week Alisa at Where’s my backpack has chosen Time as her weekly Travel Theme. I am always watching the time trying to coordinate multiple projects and schedules for both my work and my family so I thought this would be an easy post to illustrate with a great image. A quick look through my pictures though didn’t uncover a single image of an interesting clock or anything that immediately said “time”. Apparently when I am out having fun and taking pictures I don’t want to be reminded that the hours are passing and the lists are waiting to be checked off! I decided to post two pictures today from a memorable trip to Santa Fe, NM. This was my third visit to the area and each time I am there I love the contrasts between the lush green of my home state and the old Adobe architecture and history of New Mexico. 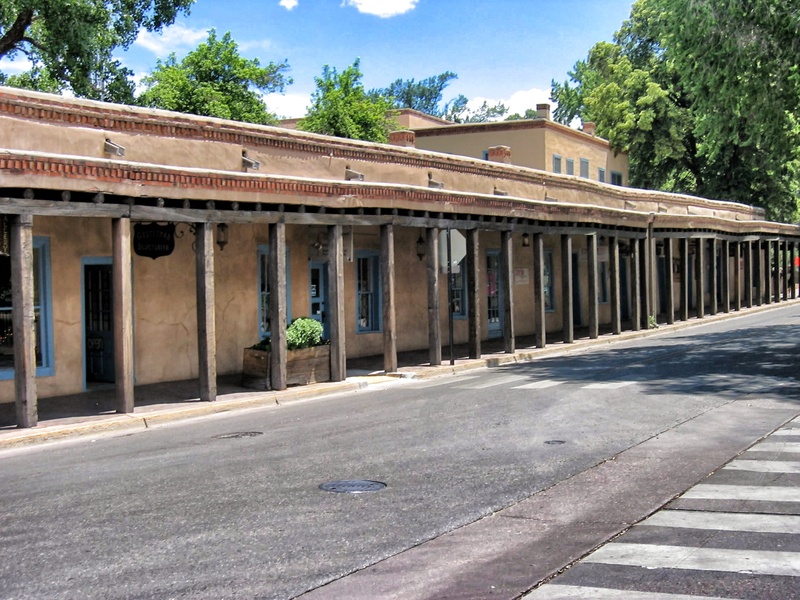 This street is just off the popular Santa Fe Plaza and the buildings date from the early 1600’s. If you look closely at the center of the sidewalk you can see a stop sign that was cut to fit between the posts and roofline directing modern car traffic to wait for pedestrians at the cross walk. I like to think its a reminder to stop hurrying through the day and take a look at what is around you. 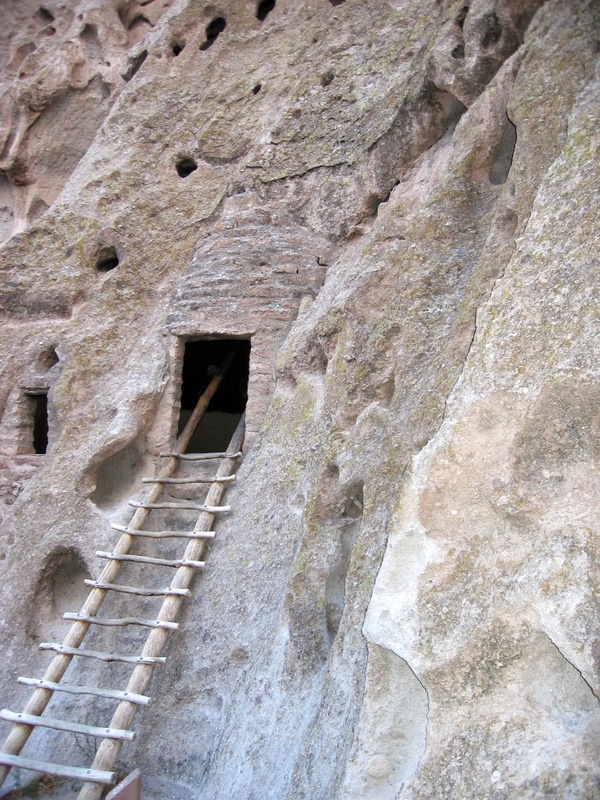 This picture is from Bandelier National Monument and shows the entrance to one of the amazing cliff dwellings that fill this valley. The Ancestral Pueblo people lived here from approximately 1150 CE to 1550 CE and the modern ladders allow each visitor to climb up into the caves and take a moment to feel what it would have been like to call them home. I’d love to go to New Mexico some day. I suspect the architecture there is much different than what I’m used to seeing in Ohio. It is very different from what I am used to and if you get to travel through the state you will see lots of regional differences too. My first time in Santa Fe I couldn’t stop looking at all of the Adobe buildings, even gas stations and mini-marts! I have been to both Santa Fe and Bandolier National Monument. I like your photos, they bring back fond memories. My challenge yesterday was to keep my feet out of the fish-eye photos. Those lenses cover a lot of ground! Yes it must have! Some of the ladders were huge. I remember climbing those Bandelier ladders when I was a kid. How fun! I have some great pictures of my son and sister on them too. It is nice to hear from people who share these same experiences. Thanks, that is what I love about these travel themes. Each week is a chance to see more of the world! I’ve been to both of those places – the central area in Santa Fe and Bandelier. Those ladders led up to a different world, truly. I could still feel the spirit of the ancient dwellers there. Isn’t Bandelier amazing… the last time I was there we were the only people around and a thunder storm was coming in. It was so beautiful. Thanks for visiting my posts today. I’ll have to look for that Stop sign the next time I’m in Santa Fe! And I love Bandelier, I’m sure I’ve been up that ladder!